by Gilbert Carpenter Sr. & Jr. 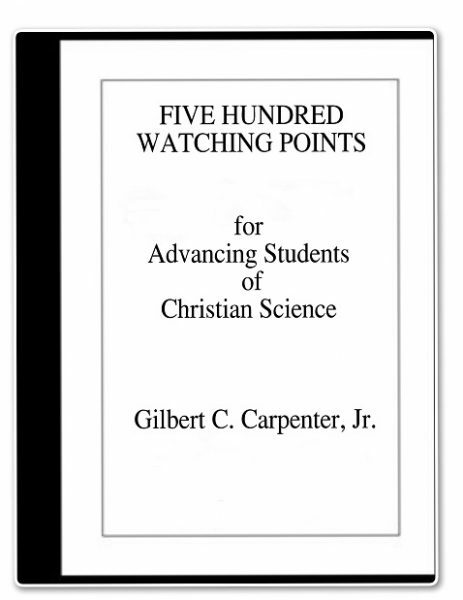 In this book are five hundred forms of animal magnetism that the astute Christian Scientist should recognize and handle. This thought provoking book alerts one to subtle mesmeric influence that would otherwise go unnoticed and unhandled. It includes many statements from Mrs. Eddy to her students. Among the Watches are the following: “WATCH lest you become a pillar of salt, in that you do not promptly and rightly complete each demonstration. No demonstration is finished if you look back to see the destruction of the error, since looking back carries the implication that, although the unreality of the error is now being demonstrated, it was once real. “Christian Science, Mrs. Eddy tells us, is divine Science reduced to human apprehension. The former carries the admission of a human problem, while the latter does not. No demonstration is finished until you retreat into divine Science and realize that no error ever existed, or even claimed to exist; hence there was nothing to be destroyed. “The pillar of salt in the case of Lot’s wife might have represented the unfruitfulness following the fact that she looked back to effect, when all attention should be given to cause. Instead of clinging to Christian Science, one should be rising to divine Science. “WATCH lest the quickening within yourself concerning animal magnetism, which comes with spiritual progress, be interpreted as an increase in its power, activity and subtlety, instead of the uncovering in your own thought of a latent fear of it, or belief in it. Error cannot be handled rightly and destroyed until one has traced all effect back to cause, and recognized that, although the mesmerism comes from outside, the yielding to it lies within your own thinking.